Coral & Aquatic Features — Createk Inc.
Zoos and Aquariums have come a long way since the days of simple cages and tanks. Today, zoological parks and aquariums strive to provide their animals with the most naturalistic recreations of their native habitats. For land animals, we build naturalistic terrains complete with our realistic trees, plants, rocks, and caves. 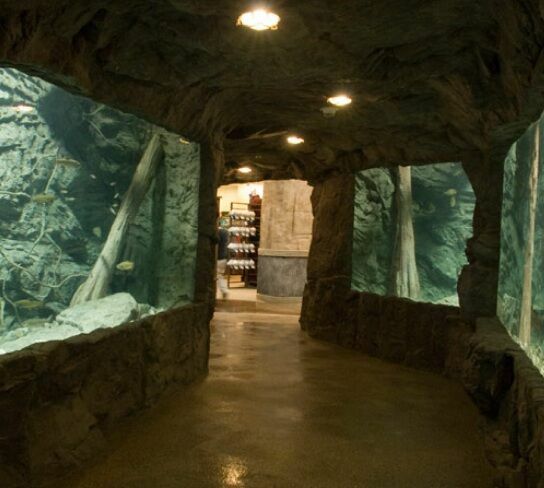 For our aquatic friends, we create majestic water themed displays, rocky rivers, tidal pools, and saltwater reefs. We can even design and build the signs, displays, and architectural enhancements that adorn the park grounds. Createk is proud to work with some of the country’s best zoos and aquariums to produce the most stunning and realistic zoological habitats aside from Mother Nature herself. To name a few, Createk has worked with SeaWorld, Mystic Aquarium, and Cabela’s Retail Stores. Many of our patented composite resin, Createk’s zoo and aquarium products are ultra-realistic and have many advantages over the real thing. All of our products are sunlight and UV stable and will not fade, stain, chip, or break after extended exposure to the elements. Our rock and water features (including artificial water, snow, and ice) resist buildup to algae and other organic growth and will not leach lime or display calcium buildup. Since the color is infused throughout our material, Createk products never need to be touched up or painted if chipped or scratched. From underwater paradise to outdoor turf and terrain, Createk can help you realize the possibilities of your project with amazing realism and brilliance. We can either design a project based on your vision or work with your designers and architects to satisfy your exact specifications. From concept development to installation, Createk is driven to provide you and your customers with the most realistic and attractive zoological habitats available. Natural reproductions such as coral are always a creative and elegant feature found in natural habitats and custom water features. Createk's patented material and process will re-create coral and other marine plants as close to perfect as one could obtain.